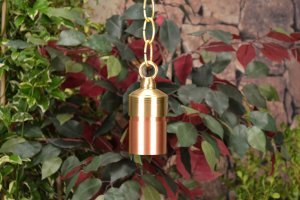 The Lancaster is the first hanging niche light in the Copper Knights series. This versatile copper fixture is perfect when down-lighting is required or when you desire a moonlighting effect. Perfect when you need a softly lit environment. The optional 1 foot brass chain makes this fixture ideal for trees, gazebos and other structures. The Lancaster has a copper shroud with brass hook and optional chain. Precision machined from copper and brass casting. Body design provides enclosed, water resistant wireway to protect wires. Exclusive Natural Copper is standard. Unique™ Lightings’ Natural Copper finish is a “living finish” and will naturally patina and change over time. Polyester powder coat finishes are also available. The Copper Knights™ Family of products from Unique Lighting Systems® carries a limited 15 year warranty against manufacturer’s defects.